Aquaculture and the management of an aqua-dependent environment is a challenging venture. With maintenance, management, inventory, and planning, the time and effort you put in is long and virtually endless. But the reward of designing, developing and maintaining such an environment is immeasurable. It's our mission at Aquatic Solutions to help you with the sustainability of your production as well as help grow, educate and spread the news of Aquaculture, Aquaponics and Aquatic-based ventures for the good of our neighbors and humanity as a whole. These ventures are an integral part of communities all over the world. From small family farms to community-supporting systems that empower once starving families to support and flourish for generations to come. 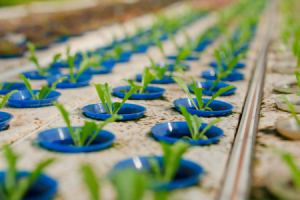 From tanks to pumps, fish food, water, supplements and more, Aquatic Solutions has the materials you need to make your Aquaponics system successful. For a full listing of products or supplies needed for your Aquaponics or Aquaculture environment, please click here. We will PERSONALLY respond to any request for information and help continue your efforts in building a better future through Aquaculture!